Mario Tennis Aces confounds in countless ways. It almost feels like some 3rd party came up with the core concept of the game, tennis gameplay mixed with fighting game mechanics, and then passed the development to the team at Camelot. How else could a game be so brilliant at its core, but so frustrating in execution. Three weeks after release, Mario Tennis Aces fails to live up to its potential. Just about everything aside from the core gameplay makes one scratch their head and wonder how this promising project could turn out so underwhelming. Aces has so much going for it at first glance. The gameplay seems deep, with interesting twists on old school Mario Tennis at every turn. Opponent’s rackets have health that diminishes when an attempt to return a Zone Shot or Special Shot is poorly timed. If your two rackets break, you lose the match regardless of score. This allows players to apply pressure on their opponent regardless of how good they are at hitting their different standard shots. A meter determines when the zone and special shots can be used, as well as their defensive counterpart, Zone Speed. To fill the gauge, players must sustain long rallies, hit nice serves, charge up groundstrokes or perform trick shots. Having the edge in meter means the world in Aces. By controlling the game with special shots, your rivals will have no chance to keep up. This leads to some cool strategies. It’s often better to accept defeat on a point if it means draining an opponent’s meter. Weaker opponents will struggle to return zone shots with good timing, leading to a racket break. It’s easy to bully rivals around when you’ve got that meter filled up. These mechanics are easy to learn as well. The game does not do a good job of teaching you how everything works, not even in its story mode, but it’s simple enough to grasp after playing a few games. 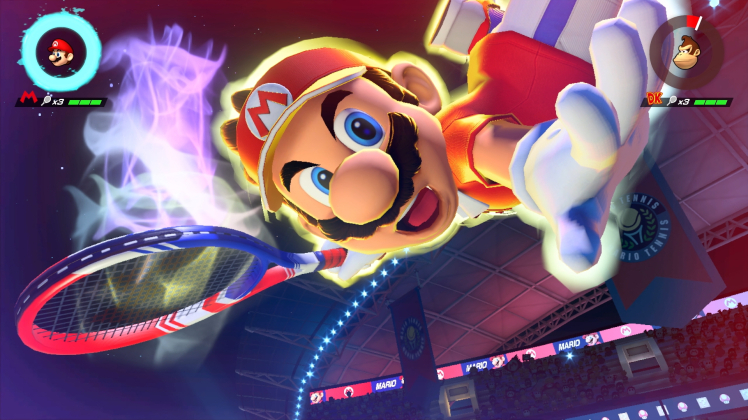 Mario Tennis veterans will feel right at home, and beginners can practice against computers of varying competence until they’re ready to play online. When things are running smoothly, and players are on an even playing field, Aces shines. Competitors will enjoy epic rallies of staggering length once they have the mechanics down. It’s easy to conceive a world where Aces revives the Mario sports franchise. This is not the one for several avoidable reasons. As fun as Aces is to learn, once you have the basics down things take a turn for the worse. Mario Tennis Aces feels like a broken game at times, both on and off the court. There are two main culprits here: Trick Shots and Defensive Characters. Trick shots, used to generate meter, are branded in the game as “risky” maneuvers. In reality, there is no risk to trick shotting every ball that comes your way. At worst, time will slow down and you’ll lose a minuscule amount of meter and return the ball without losing form. Every single character can trick shot indefinitely with just about no risk. Drop shots and well charged, perfectly located lob shots occasionally defeat trick shot spammers, but adjusting to those strategies is easy. The amount of range a trick shot covers is absolutely silly. Characters will zoom across the entire court to save a ball, or launch back and easily return a ball that was well past them. At high-level play, trick shotting every ball that comes your way is the only way to win. This takes away so much of the game’s complexity. If executing a trick shot took skill, at least there would be a learning curve. Unfortunately, the mechanic requires no thinking at all. Ball out of reach? Just flick the right stick towards it and your character will go get it. Matches still are generally fun to play despite this. Rallies can drag on for far too long, but there’s still that jockeying for meter mechanic to consider. Trick shots need to be altered for Aces to have any competitive staying power, but they aren’t the most broken part of the game. That honor goes to Bowser Jr. and Waluigi. These two characters, Bowser Jr. specifically, are far and away better than the rest of the cast. They get to every ball without breaking form, boast decent enough strength to score effectively, and any ball that happens to get by them can be returned with a backward trick shot. They don’t get staggered like other characters when blocking a special shot either, removing the one major weakness that other strong characters like Peach have. Waluigi is frustrating to face, but beatable. 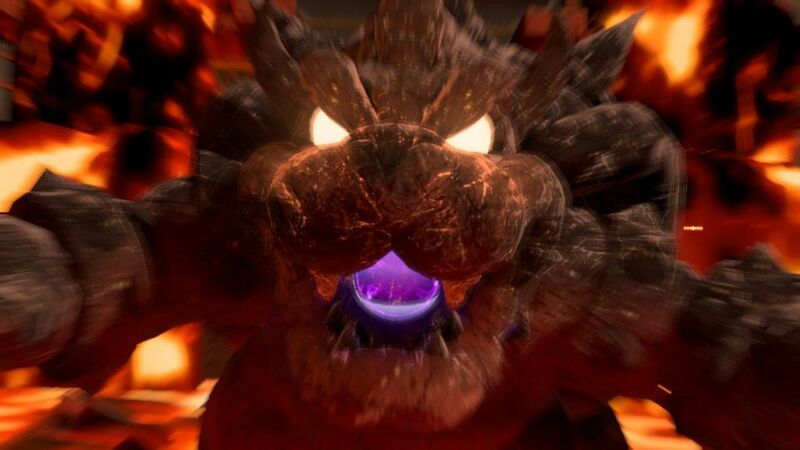 His range is not as overwhelming as Bowser Jr.’s. But Bowser Jr. is so strong that even a mediocre player could best a fantastic one by using him. Those who haven’t followed Aces may believe that to be hyperbole, but it is not. Check out the current Top 10 leaderboard. It’s all Bowser Jr. If you want to play this game competitively, Bowser Jr. is the best pick by far. Recently, a Yoshi main actually won the first national Aces tournament, though the rest of his peers played Jr. The fact that Camelot did not balance this character before launch astounds me. It took the internet a collective 12 hours to determine that he was the best character. How professional developers allowed this level of imbalance to be in the game upon release is beyond me. It’s almost like they didn’t play their own game. Fortunately, Camelot has reassured players that both game mechanics and character balance will be tweaked in the coming months. Still, many Aces players have lost interest in the game due to roster balance. Simple Mode to the Rescue? For players who get sick of Trick Shots, Aces also features a Simple Mode that turns meters off and reduces the game to simple tennis mechanics. This does alleviate one of Bowser Jr.’s biggest strengths, his incredible trick shot, but it doesn’t prevent the young prince and Waluigi from getting to every ball. In fact, Simple Mode feels inferior to Standard mode in every way. Aces doesn’t have the deepest tennis mechanics, and by removing the arcade action the game feels empty. Frustrating moments don’t escape this mode either. Characters often miss put-aways that any competent tennis player would easily have due to a lack of control or strength. As a Daisy player, I constantly find myself flustered when I have the whole court to score, only to have Daisy gently place the ball in play when she easily could have smashed it for a point. Lob shots are especially frustrating here. So often a player hits a weak return right to you at the net, only for your attempted lob to land smack in the middle of the court. The more you charge, the further back your lob will go, but the game really should put more weight on the velocity of the other person’s shot when considering the strength of your return. With characters like Waluigi and Bowser Jr. already able to return so many shots, the fact that easy put-aways get botched so frequently is infuriating. Simple mode does highlight the different shots each player has well, however. While topspin, slice, flat, drop, and lob are the five basic shots, the first three actually have different variations based on charge. Every character’s shots have different mechanics too. For example, Toadette has an incredibly nasty single charged slice shot. Peach, on the other hand, lacks a good slice but possesses an incredible single charged flat. Bowser’s double charged topspin is something to behold, and Boo’s double charged slices are as lethal as ever. Aces was not developed with balancing in mind, but the core mechanics are still a lot of fun. As bad as Bowser Jr. and Waluigi are, the rest of the cast feels great for the most part. 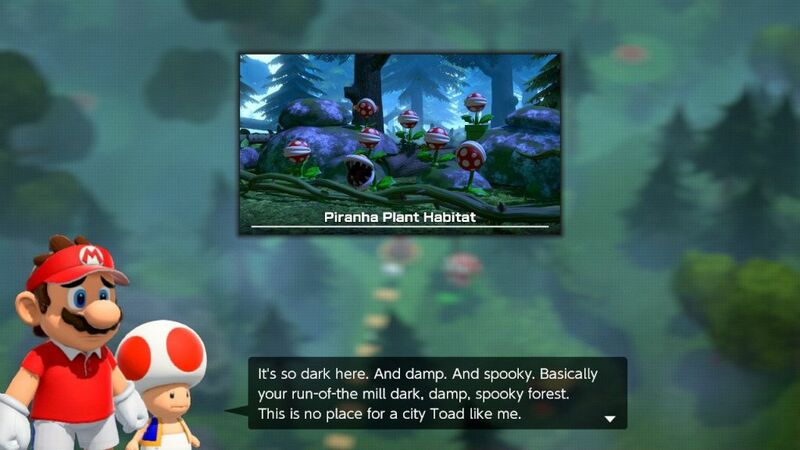 Toad’s pretty useless, but each character has strengths and weaknesses that are fun to explore. While Wario easily losses form on well place balls, he has a great trick shot to make up for it. 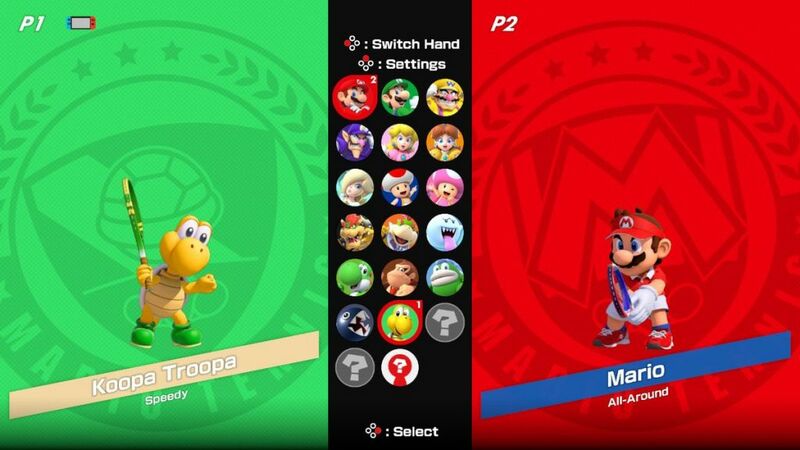 Donkey Kong blends speed and power well, while Yoshi makes up for a lack of strength with incredible speed. Characters within the same class still feel very different from one another, making exploring the roster a lot of fun. And the characters that are here are great. Spike is a funny addition to the cast, as is the comical Chain Chomp. He doesn’t have hands, but that never stopped Goomba from playing baseball! With other favorites like Diddy Kong, Blooper, and Birdo on the way, Aces has a nice variety of faces to choose from. 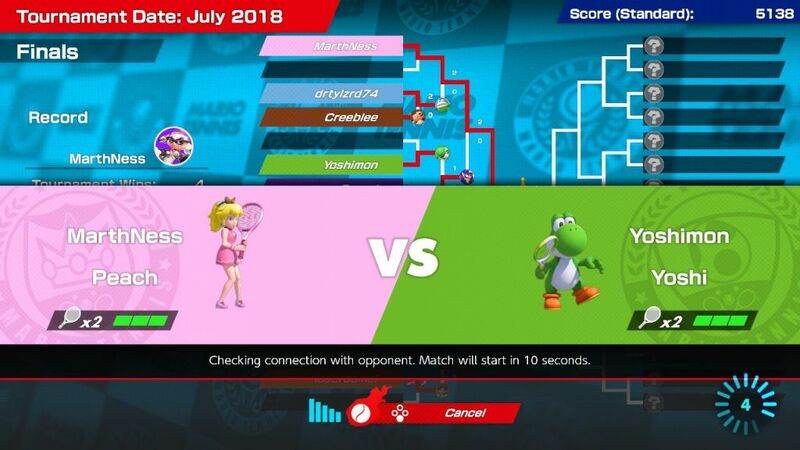 Personally, I can sort of overlook the frustrating UI in Mario Tennis Aces. That being said, it still has objectively poor design. If you want to play on a certain court, instead of selecting that court, you have to go into the options to turn the others off. Want to play double and change teams? You’ll have to swap controllers or deal with random pairings if you don’t want to back out to the main menu after each battle. Lastly, although Aces 1 set, 2 games setting feels like the right way to play the game, it’s beyond me that Camelot didn’t give players the ability to choose things like set and match length. You cannot play a 3-set match with your friends. There’s no option for it. Taking away that choice from players hurts the overall package. More frustrating, you play mandatory 3-set matches in the single player mode! Fortunately, Aces does play well online. Before each match players can wait for 10 seconds while the game tests their connection to a found opponent. Players can back out at any point, and the game won’t put you in a match if the connection is beneath a certain level. Matchmaking has improved since launch as well. Players are matched via an ELO rating score. Rarely do I play someone who I simply outclass, and never is there someone who leaves me feeling helpless on the court. If you’re getting Mario Tennis Aces for the single player, please stop and put the game down before you hand it to the cashier. This is a multiplayer game first and foremost. The single player campaign is just there to beef things out. That being said, I actually enjoyed it quite a bit. There’s a stupid level up mechanic that improves Mario’s skills, but you can just ignore it. I played the game a ton before diving into the campaign, and was able to beat it without ever having to level grind. You’ll have a nice little range of activities to do here as well. Mario and Toad traverse the island on a quest to save Luigi from a cursed tennis racket. You’ll play standard tennis matches on gimmick courses throughout the journey, but I found I actually enjoyed the mini-games more. One has you trying to smash as many targets as you can to score points, while another focuses on creating a long rally streak. The expert stage for that rally game can be frustrating, but outside of that blip (the stage is optional) these games are a ton of fun. Boss battles stand out as well. Each has you dodging attacks with trick shots, rallying against a boss with a variety of round objects, and aiming for weak points using zone shots. Every boss follows a similar flow, but there are only five or six in the game. They never get repetitive and definitely are standout moments. All in, the single player should take you between 3 and 7 hours depending on how much you practice beforehand. It’s nothing special, but better than having nothing at all. As far as content goes, that’s it. There are no mini-games you can play with friends. Not even the challenges found in single player mode. Ring shot was a highlight in Mario Tennis on the N64, and it really should be here. Nintendo has said they’ll be adding content to the game in the coming months. This strategy has been used before, with ARMS and Splatoon 2, but Aces stands as the worst example of the practice in action. The only content confirmed for the future is characters. Characters whose data is already in the game. Unlocking these characters is only possible by competing in an online tournament (or waiting for the end of the month). You don’t even have to win to unlock them. Simply entering a match gets you the character. You could disconnect right away and still receive them. I don’t see how this incentivizes players to get back into the game. While more may be coming, right now this is what we’ve got. It’s yet another jaw-droppingly poor design choice by the development team. Despite all of this, I personally enjoyed Mario Tennis Aces overall. 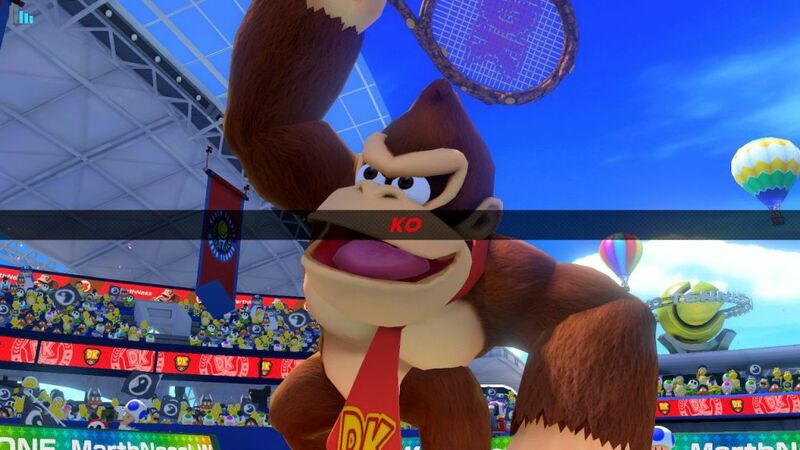 Still, I love competitive multiplayer games and am a life-long Mario Tennis fan. To me, Aces is worth the $60. That being said, I review games based on how well made they are. As far as competitive multiplayer games go, Mario Tennis Aces leaves so much to be desired. I can’t recommend this game to anyone but people like me – those who love competitive multiplayer games. ARMS, Mario Kart 8 Deluxe, and Splatoon 2 are better online games already available on Switch. Despite all of its glaring short comings, Mario Tennis Aces is close to something great. If the core gameplay was balanced, it would earn a 4/5 despite a lackluster single player campaign and terrible UI. Future updates could make the game great, but right now Aces is like a talented professional too lazy to put in the work needed to crack the Top 30.